To setup a new account simply transport yourself to TheBank World from within the Outerworlds Universe. When you arrive, you will find a new VR Teller that will answer to your verbal commands! Be sure and leave a space in between each word and do not use the brackets. You will then receive a whisper from the Banker telling you your account has been created! This command let’s you find out if a certain person you wish to send vrcash to has an account and their current citname. The Banker will then whisper back the needed information! This command let’s you transfer funds to another citizen with a bank account. The Banker will then ask if you really want to send $1000 vrbucks to citizen account 1234. Answer “yes” if you do. That’s it. You have just sent vrcash to citizen 1234! This command simply let’s you change the password to your Bank account. This final command let’s you change your email address. As you can see the Bank is now fully interactive and you can setup an account, transfer funds, and update all your account information within the world. The New Banking System also has a web interface that allows you to transfer cash, check balances, and change your account information in real time! Please note: You must be an active citizen to create an account and they can only be created in TheBank world. Accounts cannot be created from the web interface. 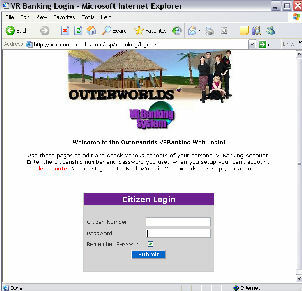 To login simply click the VR Banking System icon at the top of the page or follow this link. Using the Web Interface is really easy. Go to the Login page and fill out your information. Use your Citizenship Number and the Password you used to setup the Bank account. Do not use your name as the login will fail. After logging in, you’ll be able to view all aspects of your VRBanking Account. Your balance and last few transactions will be listed for you to keep track of your account easily. Another great feature is the ability to update your citizen name, password, and email address in real time just like in TheBank world! You will also find a search feature to help locate other account holders by citizenship number or name. The transfer of funds can also be done here with just a couples of clicks of the mouse. Now Outerworlds gives you multiple ways to use your VRBanking account to it’s fullest potential! Fully interactive in the worlds or use the web based page for times when your not logged into the Universe. Either way I think you’ll agree that this is Virtually the only way to Bank! Please note: If your Outerworlds citizenship expires or is cancelled for any reason, bank accounts are subject to removal without warning.